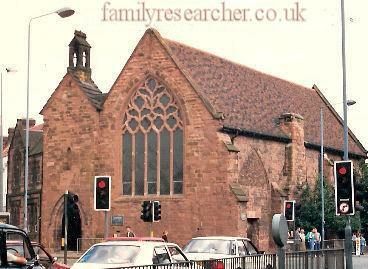 These pages are devoted to Historic Buildings and areas of Coventry that are suffering from neglect or ill treatment. Having done a great job of restoring Coventry's Old Grammar School, the building re-opened in 2015. Delighted to say, the renovations and refurbishment has been done to a high quality, and the Old Grammar School looks amazing now. I had a guided tour in 2015, and was very impressed. Well done to all involved! The Old Grammar School was built circa 1340 as a chapel for the 12th Century St John the Baptist Hospital. The Hospital was a victim of the Dissolution of the Monasteries. Then, in 1545, this once beautiful sandstone building was turned into a Grammar School by John Hales, with King Henry VIII setting a condition that it becomne a Free School. Tragically, in 1794, the Old Grammar School was widened, which meant the demolition of the half timbered section of the building. The April 1941 aird raids on the city during the Coventry Blitz meant further damage to this wonderful old building. Understandably, repairs to this old building were not prioritised during the rebuilding of Coventry as it rose phoenix-like from the ashes of the blitz, meaning that the Old Grammar School waited until the 1960s for repairs. Even during its decades of abandonment prior to 2015, the Old Grammar School remained a Coventry landmark building, and a reminder of the city's ancient history and heritage to passers by en route to Pool Meadow. The pupils used choir stalls, moved from Whitefriars Church, as desks. It survived as a school for about 300 years then came under threat when the school moved, and was only saved by public subscription. 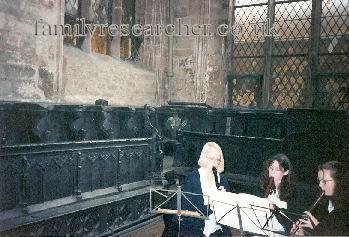 Photo shows the interior of the Old Grammar School in Hales Street, including the choir stalls moved from Whitefriars church, many bearing the graffiti of bored students from hundreds of years ago. Note that this photo pre-dates the restoration work. It is good to see that the refurbishment did not destroy the historic, centuries-old graffiti carved by bored schoolboys of yesteryear! When all the good people of Coventry are abed, the dead wander the streets! Or so it is claimed in 'Haunted Coventry', which features spooky stories galore from the city and surrounding area. Within these pages you will find the Phantom Monk of Priory Row, ghostly grey ladies, a spectre that appears to do the washing up, a phantom lorry, spooky seances, and the Devil himself, rattling chains at Whitefriars - just a taste of the many restless spirits to be found in haunted Coventry. From spectres in the suburbs to haunted pubs, this fascinating collection of strange sightings and happenings in the city is sure to appeal to anyone intrigued by Coventry's haunted heritage.